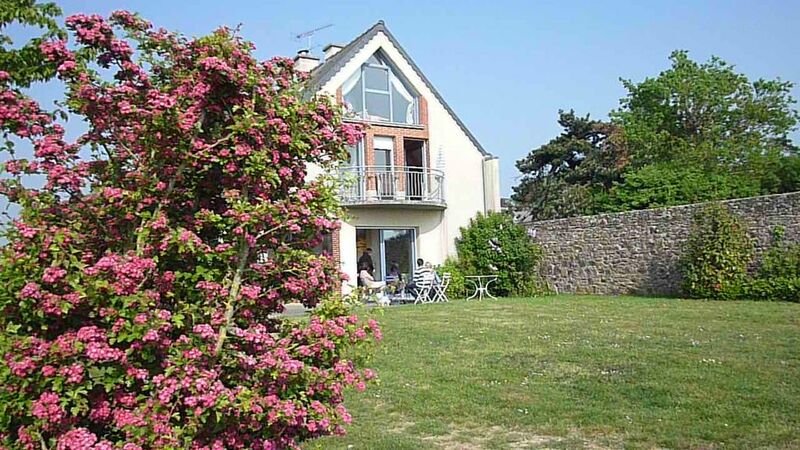 independent, comfortable house for 6 people, surrounded by a garden with open views of the sea, Granville and the tip of Cancale. Living room with two large windows opening onto a terrace, including a well-equipped kitchenette. A rear kitchen with fridge, freezer, washing machine, microwave, iron and ironing board. Outside; 2 garden furniture, 2 chairs, 2 umbrellas, barbecue. Outside, garden furniture, 2 chairs, 2 umbrellas, barbecue. The house was very clean, tidy and extremely well equipped. It was only a short distance from a beautiful beach and a stunning coastal path. It was ideally situated for day trips to Mont St Michel, The Bayeau Tapestry and the Normandy beaches (Utah, Sword, Omaha, & Juno). We had a great time even though the weather was changeable. I would definitely recommend this house. Das Haus ist toll. Vermieterin sehr nett. Meer super. Umgebung für Gehbehinderte schwierig. Viel auf und ab. Prachtig ruim huis, vlak bij een mooi strand! La réservation de la location est ferme après réception de l'acompte. Le solde est à payer 10 j avant votre arrivée Possibilité de louer, hors vacances scolaires pour 2 ou 4 personnes, à un tarif préferentiel.